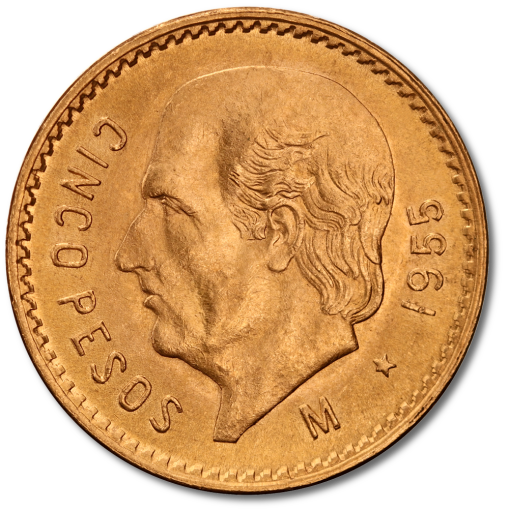 The Mexican gold five pesos used to be a very popular small bullion coin before fractional Krugerrands were introduced in 1980. The obverse features the Mexican coat of arms which depicts the Mexican golden eagle devouring a snake while perched atop a cactus. Interestingly, the 5 Pesos gold coins all feature the eagle facing forward, an antiquated version of the coat of arms developed in the French Style in the late 1800's. The reverse features Miguel Hidalgo, considered to be the chief instigator of the Mexican revolution and the "Father of the Nation". Miguel Gregorio Antonio Ignacio Hidalgo y Costilla Gallaga Mondarte Villaseñor was born on 8th May 1753, and died on 30th July 1811. In open defiance of Spanish rule, he united the downtrodden and indigenous peasants in a revolt in 1910, thus beginning the War of Independence. Hidalgo was captured shortly after the uprising began and was publicly executed.